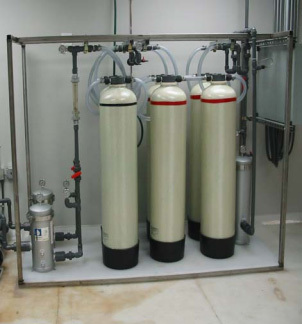 Aries designs and manufactures Ion Exchange Systems for a variety of water treatment applications. These applications include industrial and wastewater treatment, boiler makeup, semiconductor, residential softening, metals removal, product purification, food processing, pharmaceutical and chemical/petrochemical processing. Strong and Weak Acid Cation, Strong and Weak Base Anion and Mixed bed exchange resins are selected to provide the most cost effective system. Aries System design may include UF or RO systems for pre or post treatment to meet your end use requirements. For large applications, we offer a wide range of options from skid mounted systems to custom designed systems with complete Pre & Post Treatment. Our ability to customize the system to meet your specific need is the advantage of using Aries Ion Exchange Systems. Aries Ion Exchange Systems can be custom designed to meet specific end use requirements.